Crossroads Dental of Longmont (Longmont) - Book Appointment Online! At Crossroads Dental Longmont, we offer the highest quality traditional and state of the art dental services including cleanings, oral cancer screenings, metal-free restorative services and preventative care and we are also pleased to offer state of the art cosmetic dental services, Botox® and Juvederm® and Orthodontic Services. Dentist, Dr. Amy Farmer and her entire team look forward to meeting you soon! Confidence in your smile is our goal. 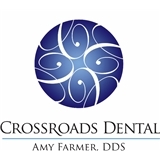 Dr. Farmer and the team at Crossroads Dental of Longmont use the latest and greatest technology to make sure your smile is not only healthy, but beautiful as well! A great practice, everyone was friendly, the office is well equipped and well decorated. The exam was thorough and informative, certainly the best I have experienced.